If you’re not an aspiring musician, you may not be familiar with TakeLessons, but the San Diego-based startup is on a mission to change that. Today, TakeLessons announced that it has raised $4 million in follow-on series A financing, led by Palo Alto’s Triangle Peak Partners, to expand its online marketplace for music lessons into new new verticals — including tutoring and the performing arts. Siemer Ventures, Pinterest Monetization Director Tim Kendall (who also held the same role at Facebook) and the startup’s existing investors, Crosslink Capital and SoftTech VC, also contributed to the round, which brings its total to over $12 million. 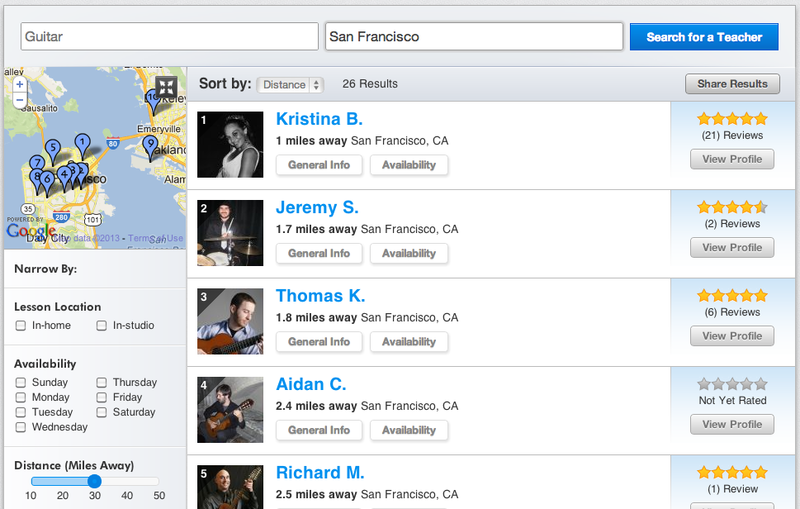 To date, the startup has paid out over $10 million to music teachers who are now serving students in over 3,000 cities. Much of this growth has come in the past year, driven by the startup’s online lesson platform, which enables aspiring musicians to take lessons online (in addition to in-person), while allowing teachers to digitize their businesses. Founded back in 2006, TakeLessons CEO Steven Cox tells us that he grew tired of the lack of available options for music lessons online — beyond the mess of content available on sites like YouTube — so he set out to create a marketplace for finding curated lessons and vetted lesson providers. Today, students can search TakeLessons for a teacher that matches their needs with respect to location, time availability, background, age and instrument. If a student finds someone they want to work with in their area, they can schedule an in-person lesson or, if not, schedule one online. Once they schedule a lesson, students can pay for lessons online or through the platform’s call center — like an eHarmony for music lessons. 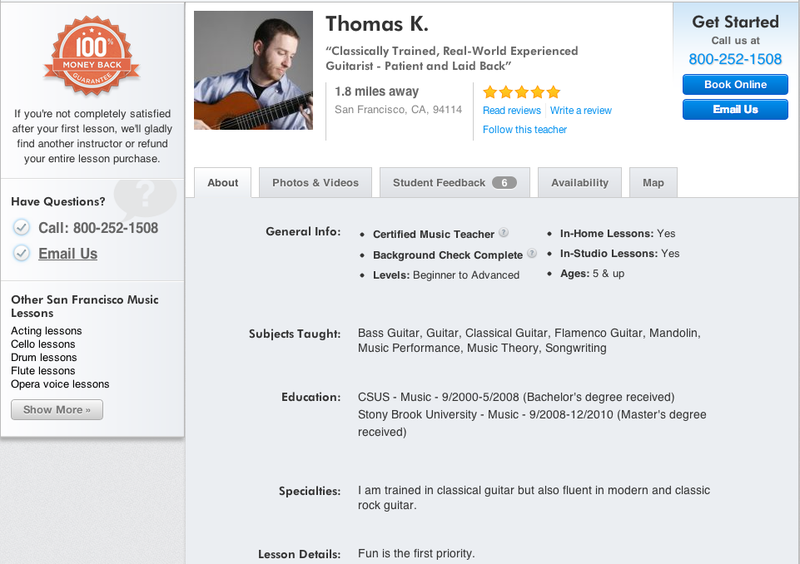 To that point, students set up profiles that describe their skill level, what they want to learn, what types of music they like and so on, which instructors can then review and use to develop a customized lesson plan. Today, Cox says, the majority of lessons occur in person, either in the student’s home or at the instructors’ studios, at which point TakeLessons verifies that students were satisfied with their teacher and then releases the payment to the instructor. For instructors, the goal is to help them make a living doing what they love, without forcing them to spend their own time or money finding new students. TakeLessons also aims to take as much of their business operations out of the instructor’s hands as it can, becoming their payment system, booking engine, scheduling tool and communications platform. Or at least that’s the idea. To that point, Cox sees TakeLesson’s potential role as being similar to that of Uber, in that it intends to be a national company that becomes a hyper-local marketplace — yet instead of offering vetted drivers, it offers vetted lesson providers. While it would seem like services like Udemy and Skillshare would be natural competitors to the TakeLessons model, the CEO sees them as potential partners, instead looking at brick-and-mortar stores as the company’s main competition. The CEO sees brick-and-mortar stores as the incumbents, which can only offer limited services in limited locations, while he says TakeLessons is currently offering service in over 100 locations in San Francisco alone. As of now, the startup covers all of the top metropolitan areas in the U.S. for in person lessons, offering an online product to those who don’t live in a city. While its coverage, quality and prices can vary city-to-city — like any marketplace with coverage of this size — overall, it’s managed impressive penetration, albeit slowly. “It’s something that’s taken time to build,” the CEO says, as the company has chosen to expand its coverage on a market-by-market basis. The other big challenge for services like this (and like Uber, Lyft, TaskRabbit and more) is maintaing quality. With a wide geographical reach and 7,500 teachers, it’s unlikely that bad eggs won’t slip through the cracks, but quality control is critical to a good user experience. To avoid crappy teachers, Cox says that the company screens and interviews each of its instructors, going through a “seven-step curation process” that is designed to weed out those who might be good musicians but aren’t so good at teaching. This includes interviews, background checks, reference checks and online training, he says. Of course, building a local marketplace city-by-city with quality service providers ain’t easy, but because it’s spent six years making headway on the music providers front, the CEO thinks the service has now reached a point in which it can begin applying the model to other verticals. With its new capital in the bank, TakeLessons will continue building out its local music providers across the country but also plans to begin adding academic tutoring, dance, acting, art and language services as well. Cox says that the startup plans to “be in over 100 cities with local tutors by June and over 1,000 cities by the end of the year. Going forward, the company also plans to step up its testing around international lessons and begin pushing service abroad at some point this year. There’s definitely some danger in attempting to port a model that works in a niche market to other niche markets, each of which has its own subtleties and nuances. Things can get complicated fast — and overall user experience can be diluted when a company tries to over-extend its service model too quickly. To defend against this, TakeLessons will try to stick to verticals that are closely related to its core business, in which its current customers can begin using immediately. As long as it doesn’t get too big for its britches, so to speak, there’s good reason to believe its expansion plans can provide added value to its customers and bring in new ones. Building a local-by-local marketplace takes time, but it can create significant defensibility if the company gets it right. It also helps that the average lesson price is $38, which while pricier than free, is cheaper than most. Students have taken 500,000 lessons to date, perhaps lower than one would expect for six years on the job, and if it’s paid out $10 million to teachers, that leaves about $9 million for the business and its 60+ person staff. The team didn’t say what revenue growth looks like currently, but as it expands into new verticals and new markets, there’s more room to grow. And $12 million from investors certainly doesn’t hurt either. For more on TakeLessons, find it at home here.